Working on a design project for worldwide audiences can be fraught with difficulties – while one colour may signify luck to one nationality; it may mean something quite different to another. Similarly, with food products – tastes and preferences, obviously, vary enormously between different countries and even regions. Hilarious linguistic gaffs are another story entirely – take Franceâ€™s Pschitt soda, Italian Mukk yoghurt or Germanyâ€™s Zit lemonade, for instance. So how do consultancies tackle international briefs and ensure projects can be tailoredÂ to local markets? and how do you make sure your designs resonate in the country they will launch in? 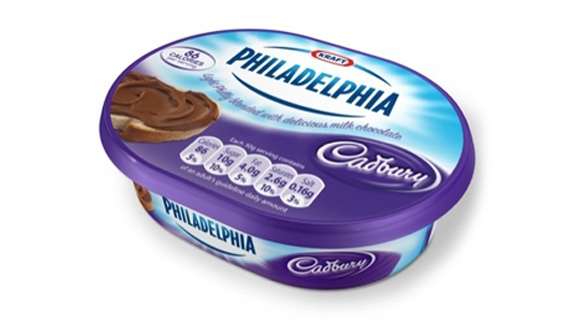 Recently Holmes & Marchant created a new variant of Philadelphia cream cheese for the UK market – the Philadelphia Cadbury product, which blends Philadelphia Cream cheese and Cadburyâ€™s chocolate. For Germany, however, the cheese will be branded with Milka Chocolate. Gore says, â€˜With global brands that we work on, we operate the old â€œglobal localâ€ argument about how people organise their brands. Gore points to the success of Unilever-owned Wallâ€™s Ice cream, which is unified globally by its iconic heart device, but uses a different name for each country – such as Frigo in Spain, Good Humor in Canada and the US, Miko in France and Morocco and Eskimo in Solvenia, Croatia and Austria.